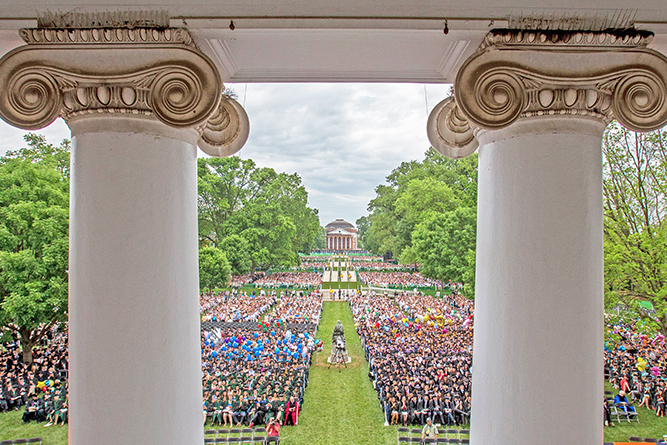 Graduation Weekend | Conference Services, U.Va. 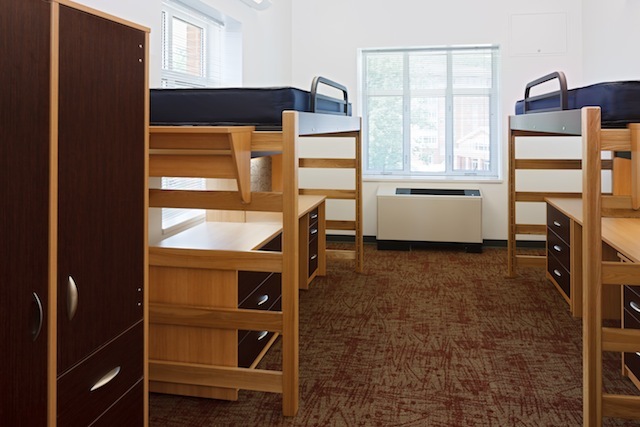 For those looking for an affordable alternative to a hotel for Finals Weekend with no minimum stay requirement, we are pleased to offer student-style accommodations in air-conditioned, first-year dorm rooms located in the Alderman Road Residence Area. Family groups will be housed together in hall-style, double-occupancy, air-conditioned student dorm rooms located in the Alderman Road Residence Area. A linen packet and complimentary continental breakfast will be provided. It is important to note that this is not a hotel, but an economical, no-frills lodging option within a 15-minute walk to the Lawn. Soap, ironing boards and other hotel-style amenities are not provided. All rooms are hall-style with two lofted single beds, two desks, two dressers, and two wardrobes. The lofted beds are not ideal for everyone, so please consider this as you reserve these accommodations for your guests. Should any member of your party require disability-related or other medical accommodations, please refer to Disability-Related and Medical Accommodations, below. Dorm accommodations are offered at a rate of $65.00 per person, per night, and guests in the same party will be housed together in the same room or group of rooms. A linen packet and complimentary continental breakfast are included in this rate. 5.3% sales tax will be added to the total payment. Rooms are limited and available on a first-come, first-served basis. Rooms are available for guests beginning Thursday, May 16 through Monday, May 20, 2019. Check-in takes place after 2:00 p.m. on the date you arrive, and all guests must check out no later than 11:00 a.m. on Monday, May 20, 2019. Dorm-style accommodations are not ideal for everyone. Beds are lofted and most can only be lowered only as far as 36” high, which is higher than a typical bed. While all of our residence halls are accessible, there are a limited number of ADA parking spaces near the dorms. Most accessible guest parking is not immediately adjacent to the accessible entrances of the buildings. It takes approximately 15 minutes to walk from the Alderman Road Residence Area to the Lawn, where graduation ceremonies take place, and you will not be able to drive your car to the ceremony site. UVA Parking and Transportation will run accessible shuttles to the Lawn for guests who cannot make this longer walk, but there is still a shorter walk required to get from the residence halls to the shuttle bus stop. Should any member of your party require a special disability-related or medical accommodation during your stay, please be sure to fill out the Special Requests and Medical Needs section when you register, including the name of the guest and as many details as possible. We will do our best to make any necessary accommodations. If you have questions, please email us at conferences@virginia.edu before you register and we will get back to you with answers. Please see the University's accessibility map for the Alderman Road area. Free parking for guests staying in residence halls will be available near Scott Stadium. This parking is located about a 10-minute walk from the Alderman Road Residential Area. Limited ADA parking is available near the residence halls on a first-come, first-served basis. Also see the University's accessibility map for the Alderman Road area.